This hiking and trekking map of the Natural Park of Sintra and Cascais by Adventure Maps is at a scale of 1:25,000. The map legend includes Portuguese, English, Spanish, French and German. 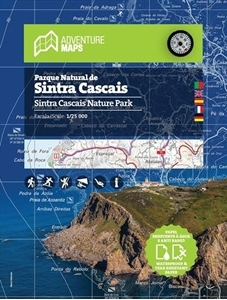 The map shows hiking trails and there is relevant tourist information on diving, climbing, surfing, hang gliding, monuments, among others. It is made of anti-tear and water resistant material, and includes a small compass.